All of the players are now in motion. Starting from NY, Washington, Boston, California, Indonesia, Palau, Kiribati, and Fiji... we have quite the diverse group. As of this afternoon, they were all in transit to either Fiji or Samoa... after a long air transit, they will THEN board the boat for the 3.5 day boat trip from Samoa to the Phoenix Islands. Almost a week of travel! 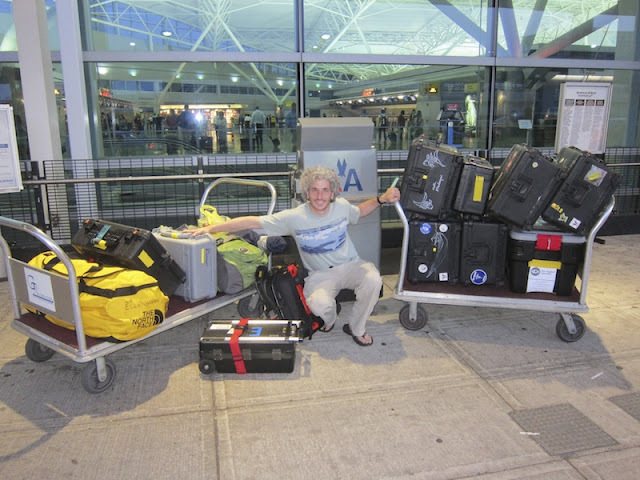 As Keith mentioned today (pictured below in NY with 12 bags of luggage and camera equipment): "I just touched down in Lax. With the international date line... Only three more days of flying to go:)". In Logan Airport, the WHOI team members checked in their bags as well. Most of the team will rendezvous in Los Angeles before heading to Fiji and then Samoa.... and then the boat leaves! Meanwhile, the ship is also in motion - en route from Fiji to Samoa as well. This transit will save the expedition members from an extra 2 days of sailing. So, even though these transits seem long, it COULD have been 2 days longer! From L to R: Kelton, Ben, Cam, Kathryn, and Hannah looking bright-eyed as they start the first leg of their long journey. And we have promises to keep.